This free downloadable guide gives step by step instructions on how to make and use your very own Louma Log Woodland Workbench! Download the pdf and share it with your woodland friends! Forest School Training Company - Providers of Forest School training across the UK. Norfolk Forest School - Norfolk County Council’s Forest School site. Forest Education Initiative - Have supported Forest School throughout the UK through cluster groups, funding and resources. 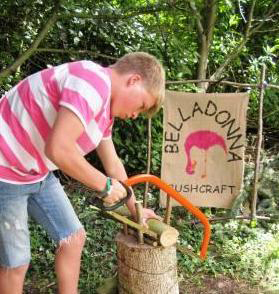 Woodcraft School - Provider of NCFE accredited Bushcraft qualifications and training courses. Bushcraft and Survival Magazine - The UK's premier bushcraft magazine. A to Z of Bushcraft - A collection of Bushcraft video clips. Norfolk Forest Education Network - Local network working to promote all types of woodland education. Norfolk’s Environmental and Outdoor Learning Team - Norfolk County Council’s Outdoor Learning teams website. The Institute of Earth Education - Helping people live lighter on the earth. Forestry Commission - The government department responsible for Britain’s forests and woodlands. Norfolk Wildlife Trust - Looking after Norfolk’s wild places and wildlife. Woodland Trust - The UK's leading woodland conservation charity. Becketts Army Surplus - Army surplus and outdoor kit suppliers in Norwich. Field Studies Council - Environmental education charity and publisher of field studies books and guides. Animated Knots by Grog - Step by step instructions on how to tie different knots and lashings. DD Hammocks - Seller of hammocks, tarps and camping supplies. BTCV - The British Trust for Conservation Volunteers sells conservation tools, equipment and has online books that can be downloaded. Muddy Faces - UK leading supplier of Forest School and outdoor play resources. Muddy Puddles - Seller of children’s waterproofs and outdoor clothing. Nature Detectives - Contains hundreds of downloadable activities for playing in the woods! The Children and Nature Network - International network supporting people and organisations working with children and nature. Small Woods Association - Supports the sustainable management of woodlands and provides guidance for landowners. Health and Safety Executive - Government department for health and safety, providing guidance and documents. Edwards Eco Buildings - Cob builders, designers and trainers. Learning Through Landscapes - The UK schools grounds charity.